Visit the latest European robotics event. now offers excellent training conditions. How can your system cope with a real RN disaster scenario? Find it out in July 2019. ENRICH is the world's first and only robotics trial that gives you pure and unspoiled real world scenarios for testing. In July 2019 we will provide you with a full blown Hazardous Materials Incident Response Operation – including finding real radiation sources, mapping challenging environments and/or manipulating radioactive material. Designed and guided by practitioners, made for the users, the industry and the R&D sector and all in the spirit of open-sciences & open-research. This Robotics Hackathon is intended to bring together roboticists on the one hand and RN professionals & specialists on the other hand. To give a better insight into possible robotic applications for radiological and nuclear tasks the event will be accompanied by a R&D workshop. As common for software hackathons ENRICH will contain a contest element as well, in which a panel of judges selects the winning teams. 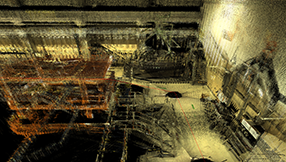 However, our main goal is to foster the development of robotic solutions for the RN domain. So, if you are interested in an exciting event in a unique environment – you are cordially invited to attend! Therefore it offers the unique opportunity for companies to demonstrate equipment in a non-competitive environment and for users to see the systems perform in current real-world scenarios. Visitors have to register in advance! For more information please see below. 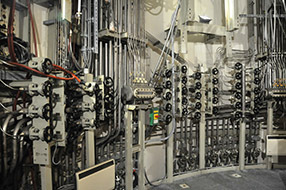 The boiling water reactor of the Zwentendorf Nuclear Power Plant (NPP Zwentendorf) is the world’s only nuclear power plant which has been completed but never put into operation. 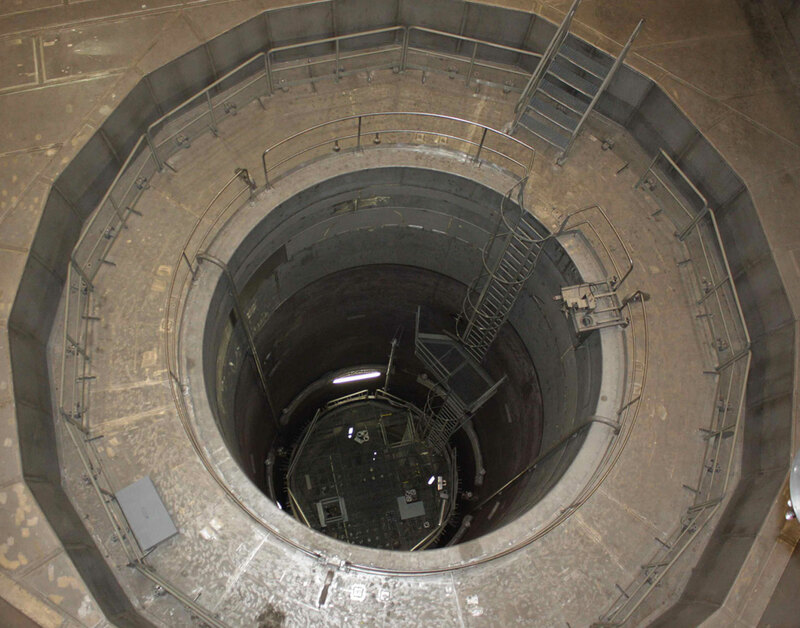 In Zwentendorf areas are easily accessible which in other NPPs can only be visited under severe difficulties. In an active nuclear power plant extensive safety precautions are needed for human personnel due to the high level of radioactivity. 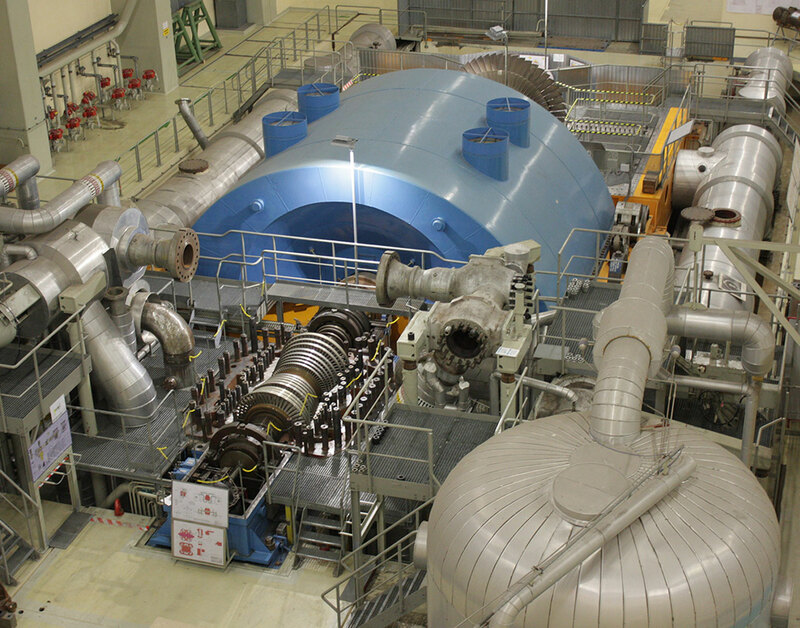 Instead, in the NPP Zwentendorf engineers have transformed the plant and turbine halls into a training centre. Repair and dismantling measures but also critical incidents and disaster scenarios can be trained under realistic conditions. Naturally, a nuclear power plant contains areas which cannot be safely entered by human personnel. On the one hand due to inherent radiation in some areas, on the other hand due to technical problems or accidents. The later case might lead to an unpredictable and uncontrolled radioactive contamination. In any of these cases a robotic system offering the ability to do remote exploration and manipulation would be very helpful. ENRICH 2017 offers three different task categories: The exploration task is divided into two sub-tasks. First, a digital 3D map of the area of interest has to be built. 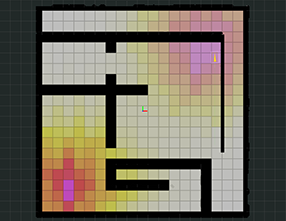 Second, radiation and its sources should be detected, measured and marked inside a digital map. The manipulation task is also divided into two sub-tasks. First, identify a specific pipe containing radioactive coolant. Second, close the corresponding valve. In the search and rescue task we will provide dummies spread throughout the building. These have to be found and the positions have to be marked in the map. Teams can choose to work on any combination of these three tasks. One or more robots may be used. 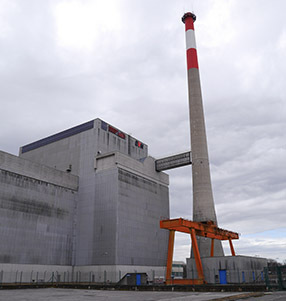 Expect the typical interior of a power plant with elements like: low or no light, closed doors, dead ends, sharp turns, blockings, steep stairs and narrow passages; see example images. 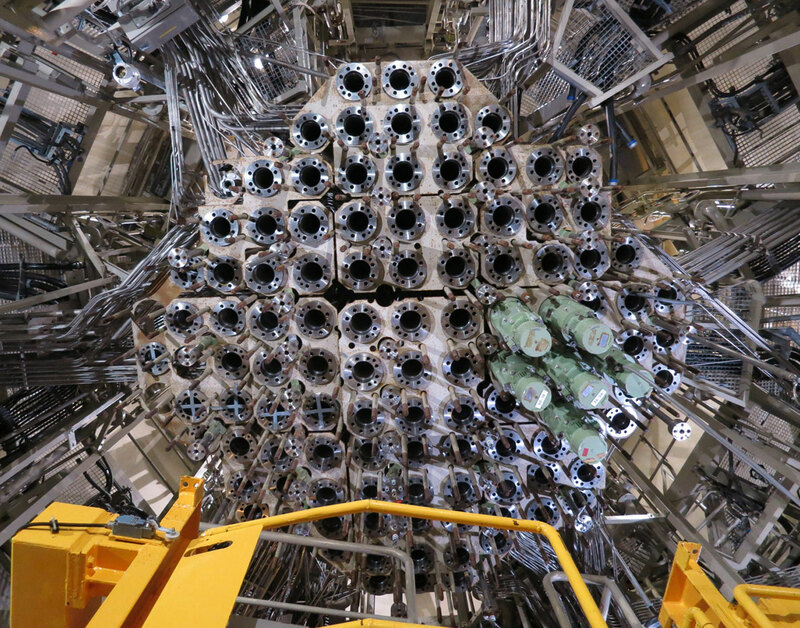 Have a look at the official virtual tour through NPP Zwentendorf for a good impression. Expect major difficulties for any kind of communication approach due to massive concrete walls and metal interiors. However, since that is not meant to prevent anyone from taking part, an optional WiFi communication infrastructure (standard IEEE 802.11a/b/g/n WLAN) will be provided for the teams. Due to the active radiation sources inside the scenario nobody is allowed to accompany the robot(s). However, the scene will be equipped with cameras, allowing some basic supervision from outside. Additionally, Austrian radiation protection officials will ensure that there is no danger caused by the RN radiation, neither for team members nor for the robot systems! A single run will last about 30 minutes plus some additional time to put the system into an operational state. So no time for debugging and online coding during the run; instead simply sign in for the next free time slot. This is a first preliminary schedule for the event, please check regularly for updates. In the likely case of further questions please feel free to contact the organisers directly via the official POC. If you plan to participate please complete these forms and send them to the official POC as soon as possible. The deadline for team applications is January 7, 2019 – due to heavy snowfall extended to January 31, 2019! Please complete this form and send it back directly to the local organizer as soon as possible! Click on the team names to get detailed team information (as PDF). Further members of the Judge Team will be published shortly. "Best 3D map of the scenario's interieur"
"Best map of RN sources and radiation distribution"
"Best manipulation abilities when handling radioactive material"
To get an impression of the achieved results and presented approaches during EnRicH 2017 visit the event's website or the media pages at flickr and YouTube. Authors are invited to submit their work for contribution. The submitted material has to be original, unpublished, and not being considered for publication elsewhere. All submitted papers will be evaluated through a scientific peer-review process. Papers will be selected for presentation with regard to their originality, novelty, technical quality and relevance for the workshop's topics. Papers should be prepared in Springer LNCS format. Authors may submit regular papers (at least 10 LNCS-equivalent pages) or short papers (5-9 LNCS-equivalent pages). Proceedings will be published by the CEUR Workshop Proceedings publication service (CEUR-WS.org). All CEUR-WS.org proceedings get a persistant and citable Uniform Resource Name (URN) provided by the German National Library, and are referenced by Scopus, Google Scholar, DBLP etc. The official language of the workshop is English. Please submit your paper as a PDF via email directly to the chairman. ADTA is the Austrian Armed Forces' technological centre of competence to support the whole life-cycle of weaponry, munitions, combat and other vehicles incl. robotics, military explosives, engineering, personal, NBC-defense, training and simulation equipment, optronical, electronical and medical materiel and provides for technical product documentation. ADTA is the MoD's primary consultant for understanding the effects of modern technologies and defining their usability for future armed forces capabilities. ADTA's scientific activities reach from laboratory efforts to providing technology services in the fields of physics, chemistry, biology, mathematics as well as civil, mechanical, materials and electrical engineering, safety and energy technology and some more. ADTA applies multi-disciplinary approaches to both advance knowledge through applied research and develop innovative technological solutions. EVN is a leading, international and publicly listed energy and environmental services company, with headquarters in Lower Austria, the country’s largest federal province. Based on state-of-the-art infrastructure, EVN provides its home market with electricity, natural gas, heat, drinking water and wastewater treatment, waste incineration and related services from a single supplier. Furthermore, the company operates cable TV and telecommunications networks and offers various energy services for private and business customers as well as municipalities as part of its portfolio. EVN is currently active in 13 countries. The Cognitive Mobile Systems Department of the Fraunhofer Institute for Communication, Information Processing and Ergonomics FKIE is working in the area of unmanned systems for more than 20 years now. Our main expertise is the development and evaluation of complex human-robot systems, with a special focus on CBRNE and nuclear & radiological reconnaissance. European Robotics aims to bridge the gap between HAZOPER (Hazardous Materials Incident Response Operations) users, industry and research with a special focus on the field of ground robotics. European Robotics is a cooperation between representatives from the users community, industry and the research community and is strictly organized on a non-profit basis. All its activities are carried out on a purely honorary and complimentary basis. European Robotics aims to bridge the gap between HAZOPER (Hazardous Materials Incident Response Operations) users, industry and research in the field of ground robotics. Nowadays industry plays the "leading" role in robotics in the sense that it often defines the robotic capabilities available. Many times this results in more or less standard robots being introduced into the HAZOPER without very thoroughly defined functional requirements. This might be an appropriate approach for those cases where the users have no vision themselves on how to use robotic support in HAZOPER. But many users do have a view of their own on their desired use of robotics. These views are often characterised by short-term objectives and a limited understanding of technical issues. Research instead has usually no short-term objective and often fails to provide practical applications. Ignoring scientific results, however, prevents interesting and innovative developments. Industry, especially medium-sized enterprises, should use research to fertilise their strategic development process. So, many times there is a gap between the industry's understanding of robots needed, the appliance of research results and the HAZOPER users' understanding of robot technology as well as the technical feasibility of their requirements. European Robotics aims to solve this situation by bringing together users, industry and researchers. European Robotics is a co-operation between representatives from the users community, industry and the research community. These are (future) professional users of ground robots that are designed for HAZOPER. These tasks are generally outdoor tasks in unstructured or urban terrain with specific threats and accuracy requirements. These are designers and manufacturers of integrated ground robots focusing on HAZOPER. These are universities and other research institutes focusing on partial solutions relevant for HAZOPER, like sensor technology or outdoor navigation algorithms. European Robotics is a non-profit organisation! All its activities are carried out on a purely honorary and complimentary basis. The IEEE Robotics and Automation Society's objectives are scientific, literary and educational in character. The Society strives for the advancement of the theory and practice of robotics and automation engineering and science and of the allied arts and sciences, and for the maintenance of high professional standards among its members. The Robototechnika Program has been implemented since autumn 2008 by the Volnoe Delo Foundation in partnership with the Ministry of Education and Science of the Russian Federation and the Agency for Strategic Initiatives. Its man content is an All-Russian system of engineering and technical competitions for children and young people in the field of high technologies, culminating in the All-Russian robotic festival "RoboFest". euRobotics AISBL is a Brussels based international non-profit association for all stakeholders in European robotics. euRobotics builds upon the success of the European Robotics Technology Platform (EUROP) and the academic network of EURON, and will not only continue the cooperation but will also strengthen the bond between members of these two community driven organisations. Thus, leading towards the establishment of only one sustainable organisation for the European robotics community as a whole. The "3rd European Network for the Advancement of Artificial Cognitive Systems, Interaction and Robotics" (EUCogIII) organises a network of researchers and builds the cognitive systems community in Europe, which straddles the divides of traditional academic disciplines in its work towards artificial intelligent systems that are autonomous, robust, flexible and self-improving in pursuing their goals. Robotics at the University of Bonn has a long history and the probabilistic robotics methodology has been and is a central element in the line of research here. Currently, there are multiple research groups that actively pursue robotics research in Bonn and collaborate closely: the Autonomous Intelligent Systems Lab, the Humanoids Robots Lab and the Lab for Photogrammetry. 1. A. Kräußling, F. E. Schneider, and D. Wildermuth, A Switching Algorithm for Tracking Extended Targets. Informatics in Control, Automation and Robotics II (ICINCO), Springer, Berlin/Heidelberg, 2007, pp. 117-128. 2. F. E. Schneider, A. Kräußling, and D. Wildermuth, Tracking Methods for Relative Localisation, Robot Motion and Control . Recent Developments, Lecture Notes in Control and Information Sciences 335, Springer, Berlin/Heidelberg, 2006, pp. 301-313. 3. L. E. Parker, F. E. Schneider, and A. C. Schultz (Eds. ), Multi Robot Systems: From Swarms to Intelligent Automata, Volume III. Proceedings from the 2005 International Workshop on Multi Robot Systems. Kluwer Academic Press, 2005. 4. A. C. Schultz, L. E. Parker, and F. E. Schneider (Eds. ), Multi Robot Systems: From Swarms to Intelligent Automata, Volume II. Proceedings from the 2003 International Workshop on Multi Robot Systems. Kluwer Academic Press, 2003. 5. W. Burgard, M Moors, and F. E. Schneider, Collaborative Exploration of Unknown Environments with Teams of Mobile Robots. In: M. Beetz, J. Hertzberg, M. Ghallab, and M. E. Pollack (Eds. ): Advances in Plan-Based Control of Robotic Agents, vol. 4266 of Lecture Notes in Computer Science, Springer, 2002. 1. F. E. Schneider and D. Wildermuth, Influences of the Robot Group Size on Cooperative Multi-Robot Localisation . Analysis and Experimental Validation. To be published in the TAROS 2011 special issue of Robotics and Autonomous Systems, 2012. 2. F. E. Schneider, D. Wildermuth, B. Brüggemann, and T. Röhling, European Land Robot Trial (ELROB) . Towards a Realistic Benchmark for Outdoor Robotics, AT&P Journal plus, vol. 2, HMH s.r.o., Bratislava, 2010, pp. 97-102. 3. F. E. Schneider and D. Wildermuth, An Application of Relative Localisation for Multi-Robot Navigation. Optoelectronics, Instrumentation and Data Processing (Avtometriya), vol. 42, no. 5, Allerton Press, New York, 2006, pp. 110-120. 4. F. E. Schneider and D. Wildermuth, Directed and Non-Directed Potential Field Approaches to Formation Navigation, Optoelectronics, Instrumentation and Data Processing (Avtometriya), vol. 42, no. 5, Allerton Press, New York, 2006, pp. 98-109. 5. F. E. Schneider, D. Wildermuth, and A. Kräußling, Discussion of Exemplary Metrics for Multi-Robot Systems for Formation Navigation, International Journal of Advanced Robotic Systems, vol. 2-4, 2005, pp. 345-353. 6. W. Burgard, M. Moors, C. Stachniss, and F. E. Schneider, Coordinated Multi-Robot Exploration, IEEE Transactions on Robotics, vol. 21, no. 3, 2005, pp. 376-386. 7. D. Wildermuth and F. E. Schneider, A Vision-based Approach for Maintaining a Common Co-ordinate System for a Group of Robots based on Vision, Robotics and Autonomous Systems, vol. 44, no. 3-4, 2003, pp. 209-217. 8. J. Grosche and F. E. Schneider, Robotik - Anspruch und Wirklichkeit. In: IT-Report 2002. 9. J. Buhmann, W. Burgard, A. B. Cremers, D. Fox, T. Hofmann, F. E. Schneider, J. Strikos, and S. Thrun, The Mobile Robot RHINO. AI Magazine, vol. 16, no. 2, 1995, pp. 31-38. 1. F. E. Schneider, D. Wildermuth and H.-L. Wolf, Professional Ground Robotic Competitions From an Educational Perspective . A Consideration Using the Example of the European Land Robot Trial (ELROB), to be published in: Proceedings of the 6th IEEE International Conference on Intelligent Systems (IS.12), Sofia, Bulgaria, 6.-8. September 2012. 3. F. E. Schneider and D. Wildermuth, Evaluating the Effect of Robot Group Size on Relative Localisation Precision. In: R. Groß et al. (Eds. ): TAROS 2011 . Proceedings of the 12th Annual Conference Towards Autonomous Robotic Systems, Lecture Notes in Artificial Intelligence 6856, Springer, Berlin/Heidelberg, pp. 149.160, 2011. 4. F. E. Schneider and D. Wildermuth, Results of the European Land Robot Trial and Their Usability for Benchmarking Outdoor Robot Systems. In: R. Groß et al. (Eds. ): TAROS 2011 . Proceedings of the 12th Annual Conference Towards Autonomous Robotic Systems, Lecture Notes in Artificial Intelligence 6856, Springer, Berlin/Heidelberg, pp. 408-409, 2011. 5. D. Wildermuth and F. E. Schneider, A Validation of Localisation Accuracy Improvements by the Combined Use of GPS and GLONASS. In: R. Groß et al. (Eds. ): TAROS 2011 . Proceedings of the 12th Annual Conference Towards Autonomous Robotic Systems, Lecture Notes in Artificial Intelligence 6856, Springer, Berlin/Heidelberg, pp. 374-375, 2011. 7. F. E. Schneider and D. Wildermuth, An Autonomous Unmanned Vehicle for CBRNE Reconnaissance. 12th International Carpathian Control Conference (ICCC), Velke Karlovice, Czech Republic, 25.-28. May 2011. 8. F. E. Schneider, T. Röhling, B. Brüggemann, and D. Wildermuth, CBRNE reconnaissance with an unmanned vehicle . a semi-autonomous approach. 2nd IFAC Symposium on Telematics Applications (IFAC-TA), Timi.oara, Romania, 5.-8. October 2010. 9. F. E. Schneider, D. Wildermuth, B. Brüggemann, and T. Röhling, European Land Robot Trial (ELROB) . Towards a Realistic Benchmark for Outdoor Robotics. 1st International Conference on Robotics in Education (RiE), Bratislava, Slovakia, 16.-17. September 2010. 10. T. Röhling, B. Brüggemann, F. Höller, and F. E. Schneider, CBRNE Hazard Detection with an Unmanned Vehicle. IEEE International Workshop on Safety, Security, and Rescue Robotics (SSRR), Denver, Colorado, 3..6. November 2009. 11. B. Brüggemann, T. Röhling, H.-L. Wolf, and F. E. Schneider, European Land Robotic Trial 2008 (ELROB) . A Realistic Benchmark for Outdoor Robotics. Conference on Autonomous Robot Systems and Competitions, Castelo Branco, Portugal, Mai 2009. 12. F. Höller, D. Schulz, M. Moors, and F. E. Schneider, Accompanying Persons with a Mobile Robot using Motion Prediction and Probabilistic Roadmaps, International Conference on Intelligent Robots and Systems (IROS), San Diego, California, 29. October . 2. November 2007. 13. S. Sehestedt and F. E. Schneider, Monte Carlo Localization in Highly Symmetric Environments. 3rd International Conference on Informatics and Control, Automation and Robotics (ICINCO), Setubal, Portugal, 1.-5. August 2006. 14. A. Kräußling, F. E. Schneider, and S. Sehestedt, Tracking multiple objects using the Viterbi algorithm. 3rd International Conference on Informatics in Control, Automation and Robotics (ICINCO), Setubal, Portugal, 1.-5. August 2006. 15. F. E. Schneider and D. Wildermuth, An Application of Relative Localisation for Multi-Robot Navigation. 2nd IASTED International Conference on Automation, Control, and Applications (ACIT-ACA), Novosibirsk, Russia, 20.-24. June 2005. 16. F. E. Schneider and D. Wildermuth, Directed and Non-Directed Potential Field Approaches to Formation Navigation. 2nd IASTED International Conference on Automation, Control, and Applications (ACIT-ACA), Novosibirsk, Russia, 20.-24. June 2005. 17. F. E. Schneider and D. Wildermuth, Experimental Comparison of a Directed and a Non-Directed Potential Field Approach to Formation Navigation. 6th IEEE International Symposium on Computational Intelligence in Robotics and Automation (CIRA), Espoo, Finland, 27. 30. June 2005. 18. A. Kräußling, F. E. Schneider, and D. Wildermuth, A Switching Algorithm for Tracking Extended Targets. 2nd International Conference on Informatics in Control, Automation and Robotics (ICINCO), Barcelona, Spain, 14.-17. September 2005. 19. F. E. Schneider, D. Wildermuth and A. Kräußling, Discussion of Exemplary Metrics for Multi-Robot Systems for Formation Navigation. 6th Conference .Towards Autonomous Robotic Systems. (TAROS), London, UK, 12.-14. September 2005. 20. A. Kräußling, F. E. Schneider, and D. Wildermuth, Tracking Expanded Objects Using the Viterbi Algorithm. IEEE International Conference on Intelligent Systems (IS 2004), Varna, Bulgaria, 22.-24. June 2004. 21. A. Kräußling, F. E. Schneider, and D. Wildermuth, Tracking of Extended Crossing Objects Using the Viterbi Algorithm. 1st International Conference on Informatics in Control, Automation and Robotics (ICINCO), Setubal, Portugal, 25.-28. August 2004. 22. F. E. Schneider, A. Kräußling, and D. Wildermuth, An approach to active sensing using the Viterbi algorithm. 7th International Symposium on Distributed Autonomous Systems (DARS), Toulouse, France, 23.-25. June 2004. 23. F. E. Schneider, M Moors, and D. Wildermuth, Methods and experiments for hazardous area activities using a multi-robot system. IEEE 2004 International Conference on Robotics and Automation (ICRA), New Orleans, USA, 26. April - 1. May 2004. 24. F. E. Schneider and D. Wildermuth, Using an Extended Kalman Filter for Relative Localisation in a Moving Robot Formation. 4th International Workshop on Robot Motion and Control (RoMoCo.04), Puszczykowo, Poland, 17.-20. June 2004. 25. F. E. Schneider, M. Moors, D. Wildermuth, and A. Kräußling, Relative position estimation in a group of robots. IEEE, International Conference on Methods and Models in Automation and Robotics (MMAR), Mi.dzyzdroje, Poland, 30. August - 2. September 2003. 26. F. E. Schneider and D. Wildermuth, A potential field based approach to multi robot formation navigation. IEEE International Conference on Robotics, Intelligent Systems and Signal Processing (RISSP), Changsha, Hunan, China, 8.-13. October 2003. 27. M. Moors, F. E. Schneider, and D. Wildermuth, Estimating a Relative Co-ordinate System for a Group of Robots. 6th International Conference on Climbing and Walking Robots and the Support Technologies for Mobile Machines (CLAWAR), Catania, Italia, 17.-19. September 2003. 28. B. Trouvain, H.-L. Wolf, and F. E. Schneider, Impact of autonomy in multi-robot systems on teleoperation performance. In: A. C. Schultz, L. E. Parker, and F. E. Schneider (Eds. ), Multi Robot Systems: From Swarms to Intelligent Automata, Volume II. Proceedings from the 2003 International Workshop on Multi Robot Systems. Kluwer Academic Press, 2003, pp. 253-264. 29. D. Wildermuth and F. E. Schneider, Maintaining a Common Co-ordinate System for a Group of Robots based on Vision. IEEE International Conference on Robotics, Intelligent Systems and Signal Processing (RISSP), Changsha, Hunan, China, 8.-13. October 2003. 30. F. E. Schneider, and D. Wildermuth, A potential field based approach to multi-robot formation navigation. 1st European Conference on Mobile Robotics (2003), Radziejowice, Poland, 4. 6. September 2003. 31. D. Wildermuth and F. E. Schneider, Maintaining a Common Coordinate System for a Group of Robots based on Vision. 7th International Conference on Intelligent Autonomous Systems (IAS 7), Marina del Rey, California, 25.-27. March 2002. 32. F. E. Schneider and B. Trouvain, Forschungsarbeiten im Projekt .Experimentelles Mensch-Mehrrobotersystem., Symposium .Robotik. of the Bundesakademie für Wehrverwaltung und Wehrtechnik (BakWVT), Mannheim, Germany, 10. December 2002. 33. F. E. Schneider and D. Wildermuth, Motion co-ordination for formations of multiple mobile robots 3rd International Conference on Field and Service Robotics (FSR), Helsinki, Finnland, 11.-13. Juni 2001. 34. B. Trouvain and F. E. Schneider, Multimodal Human-Robot Interaction using a Laserpointer and Speech, 4th European Workshop on Advanced Mobile Robots (EUROBOT.01), Lund, Sweden, 19..21. September 2001. 35. B. Trouvain, F. E. Schneider and D. Wildermuth, Integrating a multimodal human-robot interaction method into a multi-robot control station. 10th IEEE International Workshop on Robot-Human Interactive Communication (ROMAN), Bordeaux and Paris, France, 18. 21. September 2001. 36. D. Wildermuth and F. E. Schneider, Erzeugung eines gemeinsamen Koordinatensystems für eine Gruppe von Robotern auf der Basis von Bildverarbeitung, 16. Fachgespräch Autonome Mobile Systeme (AMS), Karlsruhe, Germany, 20.-21. November 2000. 37. F. E. Schneider, D. Wildermuth, and H.-L. Wolf, Concept of a man-machine-interface for a human-multi-robot-system, 1st International Conference on Mechatronics and Robotics (M&R 2000), St. Petersburg, Russia, 22.-26. May 2000. 38. F. E. Schneider, D Wildermuth, and H.-L. Wolf, Konzept einer Mensch-Maschine-Schnittstelle für ein Mensch-Mehrrobotersystem. Conference .Robotik 2000., Berlin, Germany, 29. 30. June 2000. 39. F. E. Schneider, D. Wildermuth, and H.-L. Wolf, Motion co-ordination in formations of multiple mobile robots using a potential field approach, 5th International Symposium on Distributed Autonomous Robotic Systems (DARS), Knoxville, Tennessee, 4.-6. October 2000. 40. F E. Schneider and D. Wildermuth, Simulation von Mehrrobotersystemen. 13. Fachgespräch Autonome Mobile Systeme (AMS), Stuttgart, Germany, 6.-7. October 1997. 41. F. E: Schneider and K.-P. Gärtner, Mensch-Mehrroboter-Systeme im Bereich autonomer mobiler Systeme. Deutsch-Französischer Workshop .Robotik", Ludwigshafen, Germany, June 1997. 42. F. E. Schneider, K.-P. Gärtner, and D. Wildermuth, Einsatz einer verteilten Simulation beim Entwurf von Mensch-Mehrroboter-Systemen. Symposium .Neue Technologien in der wehrtechnischen Simulation. of the Bundesakademie für Wehrverwaltung und Wehrtechnik (BakWVT), Mannheim, Germany, 30. September - 2. October 1997. 43. F. E. Schneider and K.-P. Gärtner, Teleoperation with compressed motion pictures sequences, 27th International Symposium on Industrial Robots (ISIR), Milano, Italia, 6.-8. October 1996. 44. F. E. Schneider, K.-P. Gärtner, and D. Wildermuth, Simulation eines autonomen unbemannten Landfahrzeuges, Symposium .Neue Technologien in der wehrtechnischen Simulation. of the Bundesakademie für Wehrverwaltung und Wehrtechnik (BakWVT), Mannheim, Germany, 3.-5. June 1996.